After completing his conquest of the Persian empire, Alexander the Great maneuvered his army across the Hindu Kush and into India. During his two years there, he traveled from dry frigid mountains to humid tropical lowlands and then back across one of the most punishing deserts on the planet. He fought a series of desperate battles against strange foes mounted on war-elephants, suffering wounds that nearly killed him. And when he eventually turned homeward, he brought with him specimens of a rare, magical species, a bird that could speak with a human voice. Introduced to Europe by Alexander, parrots were quickly embraced by Western culture as exotic and astonishing, full of marvelous powers, and close to the gods. Over the centuries they would become objects of veneration or figures of folly, creatures prized for their wit-or their place on the dinner table. Ultimately, they would become emblematic of the West's interaction with the world at large. Identifying a deeply rooted obsession with these beautiful and loquacious birds, Bruce Thomas Boehrer provides the first account of parrots and their impact on the Western world. Parrot Culture: Our 2500-Year-Long Fascination with the World's Most Talkative Bird traces the unusual history of parrots from their introduction in the Graeco-Roman world as items of oriental luxury, through the great age of New World exploration, to the contemporary ecological crisis of globalism. Boehrer identifies the poignant irony in the way parrots became ubiquitous as symbols and mascots, while suffering near extinction at the hands of those who desired them. 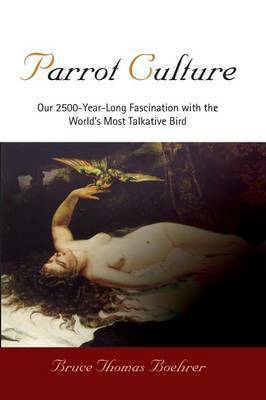 Exploring their presence and meanings in the art, literature, and history of Western civilization, Parrot Culture also celebrates the beauty, intelligence, and personality of these birds, whose fate will say as much about us and the world we have created as it will about them. Bruce Thomas Boehrer is Bertram H. Davis Professor of English at Florida State University. A life-long parrot fancier, he is the author of Shakespeare Among the Animals: Nature and Society in the Drama of Early Modern England and The Fury of Men's Gullets: Ben Jonson and the Digestive Canal.